Underfloor heating (ufh) is widely used in northern Europe and has in recent years become quite popular in the UK, both for new builds and updating existing property. As with most things, there are various factors for and against ufh and whether underfloor heating is the choice for you depends largely on your lifestyle. In this article we try to set out the advantages and drawbacks so that you can make a choice based on knowledge. With an underfloor heating system, the floor itself becomes the heat emitter and the heating of the room is from the floor up, unlike radiators in a normal central heating system where the emitters are mounted on the wall and the room is, effectively, heated from the ceiling downwards. Both electric and water based underfloor heating systems are available, they are almost identical apart from obviously, that one uses electric heating cable while the other circulated heated water through a pipe. Water based ufh uses water heated to a lower temperature than conventional water central heating (typically 50°C rather than 60°C plus), which makes it ideal for use with a high efficiency condensing boilers; the lower operating temperature also makes it more suitable for use with heat pumps or solar water heaters. The water temperature to the heating pipe is controlled by mixing the water in the pipe with hot water from the boiler to achieve the required temperature, this is then passed to a manifold for distribution to the various zones. Normally an existing conventional boiler will suit ufh, however it may be necessary to fit a higher rated pump as the back pressure may be greater than in a conventional radiator type central heating system. It should be noted that particular products are designed for specific types of installation and individual manufacturers information must be referred to before use - i.e. 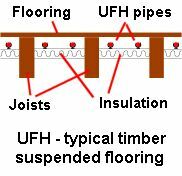 pipes for screed embedded underfloor heating may not be suitable for installing under a wooden floor; similarly the reverse may also apply. In new builds with solid floors, the heating pipe/cable is normally embedded in the floor screed. When being installed in existing buildings with solid floors, the pipe/mat (see note) is normally laid on the surface and covered by a timber, laminate or tile surface - this lifts the level of the floor which will mean that doors, skirting boards etc will also need to be lifted. 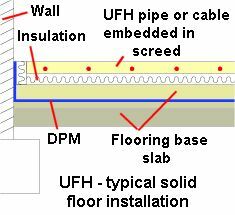 Note: Where the electric element is to be laid on a surface rather than embedded in screed, electric ufh normally uses heating mats which are usually just the cable attached to a flexible, mesh backing - this ensures that the cable remains adequately spaced. Where the floor is tiled, the pipe/cable is embedded in flexible tile adhesive - most tile adhesives are flexible. Using aluminium plates under the floorboards to spread the heat - more expensive in materials than the other options. Using a mortar filler between pipe/cable and floorboards - very labour intensive during installation - also very heavy (can be 25kg per sq.metre of flooring) so the strength of the joists needs to be considered. Clipping the pipe/cable under the floorboards (normally less than 25mm (1 inch) from the underside) - fairly cheap and quick but not as effective as the other options. The effect of the heat on timber flooring should also be considered, timber with a moisture content of less than 10% should be specified to reduce the risk of the flooring drying out then shrinking, twisting or warping. The effect of the heating on other types of flooring (e.g. laminates, vinyls) should also be considered and the manufacturer/supplier consulted if in doubt. The method of installing the flooring may need to be adjusted, i.e. thick underlays should not be used with laminates as they will act as a heat insulator. 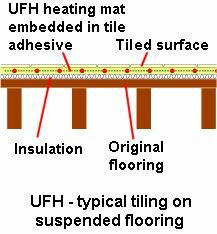 With all ufh, consideration needs to be given to any floor covering, using a heavy carpet underlay and carpet will act as a heat insulator and reduce the heating effect. Water based ufh is often claimed to be cheaper to run than central heating using radiators, part of the logic being that the water used is at a lower temperature (typically 50°C rather than 60°C plus). This claim may be justified if the heating system were switched on for 24 hours a day, but otherwise the author has yet to be convinced. It is claimed that the same level of comfort is achieved with the temperature in an ufh heated room about 2°C lower than in a room heated with conventional radiators. Wall mounted radiators act as convectors to heat the air, with underfloor heating, the whole floor area acts as a emitter for radiated heat. With no need for wall mounted emitters, there is less restriction on placing furniture in the room also less 'dust traps' so the rooms are easier to keep dust free. In wet areas, (bath, shower rooms, kitchen etc) the floors will dry off quicker. Underfloor heating should not be fitted under floor mounted units, which is quite easy to arrange in a kitchen where the position of base units etc are fixed, however it is not realistic to restrict the ufh in other rooms where the position of cupboards etc are not fixed and may be changed. Ufh beneath cupboards can cause the inside to 'sweat' and the effect of the heat may be detrimental to individual pieces of furniture.